The Trac Vac PTO systems can accommodate front or mid-driven mowers on compact tractors with a minimum of 13.5HP at rear PTO. The Model 854 mounts on a category "1" 3-pt. hitch and is designed to run on a PTO speed of 540 RPM. The Model 856 mounts on a category "1" 3-pt. hitch and is designed to run on a PTO speed of 850 RPM. Each is supported by stabilizer arms on the three point to free lift arms for raising and lowering the mower. Features include a 2-to-1 gearbox coupled to the turbine assembly with belt drive producing a turbine speed of approximately 3800 RPM. Discharge Chute and Drawbar included. The Model 854 and Model 856 come standard with a 17 cubic foot dump cart tapered four inches front to back to allow debris to fall out quickly with little clogging. The 20 gauge all steel cart cover, galvanized for long life, expands capacity to approximately fifty cubic feet. 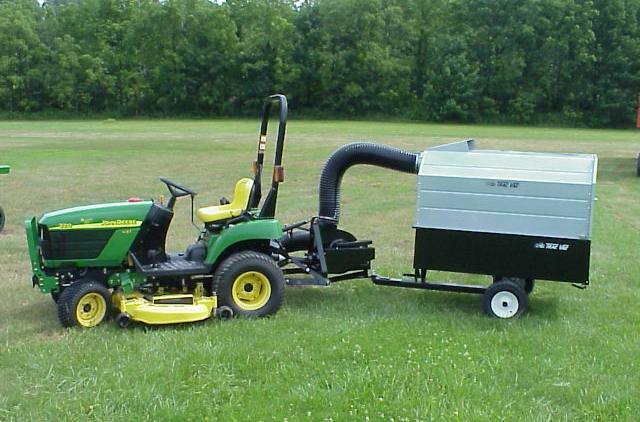 Eight inch intake and exhaust hoses move leaves, grass clippings, and light litter with a less chance of clogging. The six-bladed forward curve turbine reduces noise to a pleasing 70 decibel level while reducing the clippings and leaves for better compaction in the collection container. Lift kit additional if required. 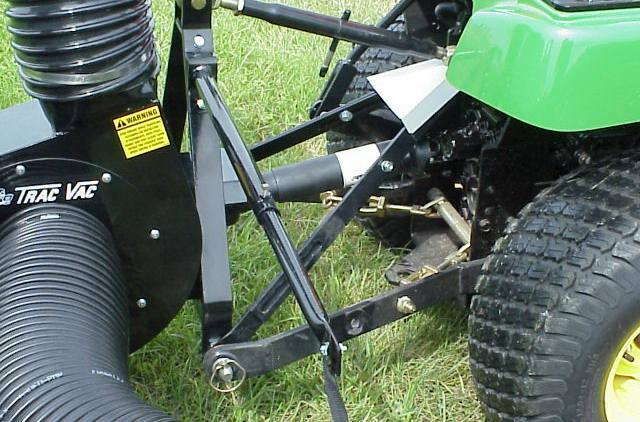 Most tractors require a special lift kit to bypass the stabilizer arms as the lift mechanism for the mower deck. Check with your distributor for these applications.